Sandra currently sings with Heartbeat UK chorus (SAI) and is the choreographer and presentation coach for both Heartbeat and Cottontown Chorus (BABS). 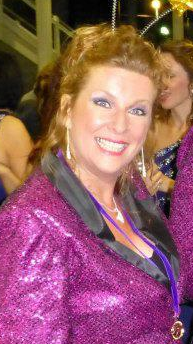 She is a certified presentation judge and coaches quartets and choruses all over the UK. Sandra joined the Liberty Belles in 1985. She has sung in a number of quartets – most notably Eu4ia (LABBS champs 2001, Sweet Ads champs 2003, 2004 and 2009, 12th in the world 2004 and European champions in 2003) and The MIX (LABBS champs 2012, European champs 2013). She was the main choreographer and coach for Liberty Belles (LABBS), Cheshire Chord Company (LABBS), Cottontown Chorus (BABS) and Heartbeat UK Chorus (SAI). In that role she has won 11 gold medals. In her spare time (which she doesn’t really have) she loves spending time with her family (her husband Tony Riley sings with Cottontown) and hoovering!